Over the past 100ish years, science regarding the nature of the universe has gone from weird to incomprehensible, bizarre and incomprehensible again because that needs to really be emphasized. For perspective, one of the most prescient pieces of cosmological study in the 1800s came from none other than Edgar Allen Poe, which is not to say poets can’t be profound, but is probably the last time a man whose legacy would be Gothic poetry will ever make it onto the list of notable cosmological theories. After Einstein made relativity special in the early early 1900s, however, science started getting crazy at a much quicker rate. The explanations for the composition of space and time now include superstring theory, M-theory, any number of Grand Unified Theories and a host of others, all of which are rather complex. xkcd on String Theory. Funny ’cause it’s true! Fortunately for us, a number of prominent physicists/astrophysicists have taken it upon themselves to write books explaining these generally inexplicable theories in terms broad enough to appeal to the masses. The upside to these “pop science” books is obvious – a wider exposure to empirical thought and an increase in public interest with regards to cutting-edge science. The downside is that, by necessity, the developments of a few brilliant researchers are culled down into terms that those of us with meager mathematical qualifications can understand, which gives rise to a class of young adults confident in their own complete understanding of unspeakably complicated cosmological theories. Stop that. Darn it all, I know I’m not the smartest guy around but it is just arrogant to think reading through a few books by Neil Degrasse Tyson qualifies you as an expert on the composition of the universe because it doesn’t! The following is a Doctor Who snippet that I feel approximates the situation rather aptly (followed by several minutes of unrelated snippets, don’t worry about it). This all leads me back to the reason I originally thought of these books – Supersymmetry! What better tangent to “symmetry” than the super-est form of it? If you’re interested, read here or here rather than depending on my poor and insufficient summary. Then check out this picture of space! 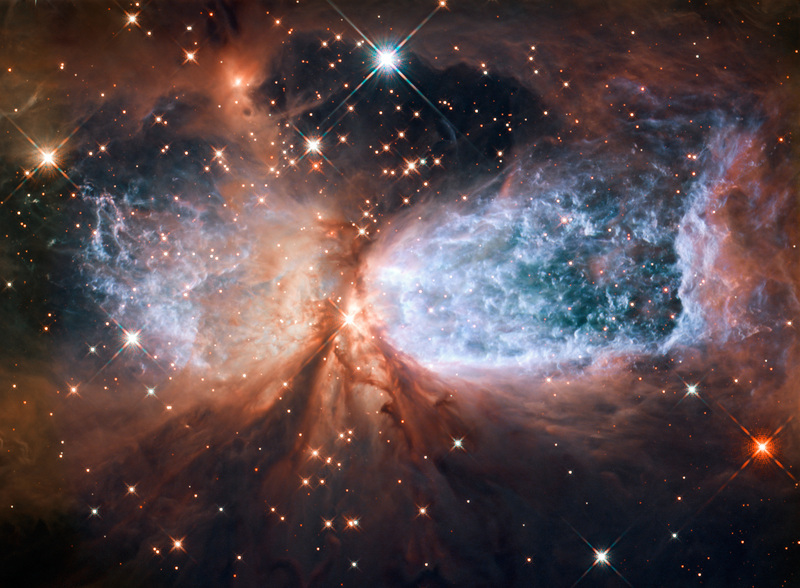 A star “nursery” captured by Hubble. *Stephen Hawking gives a talk (talk? paper? I’m actually not sure.) on why we may never be able to know everything about the universe. I may come back to completeness sometime because it is super interesting.